A disabled drawing layer will be invisible. A disabled sound layer will be mute. A disabled peg layer will not affect the position of its child layers. To disable a layer, click the layer's Enable/Disable button or press D.
To enable a layer, click the layer's Enable/Disable button or press A.
NOTENext to sound layers, the Enable/Disable layer button will look like this: . TIPYou can enable or disable all layers by clicking on the Enable or disable all layers button in the top row. Solo mode allows you to only view specific layers in the Camera view and hide all others. When solo mode is enabled on one layer, only this layer will be visible. 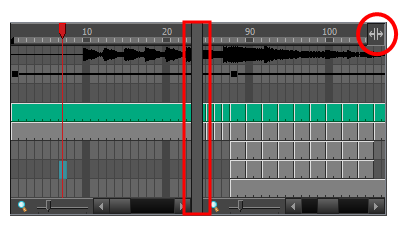 If solo mode is enabled on several layers, and only these layers will be visible. If solo mode is not enabled on any layer, all enabled layers will be visible. You can also use solo mode on sound tracks. If solo mode is enabled on any sound tracks, only those sound tracks will play during playback. TIPWhen some layers are in solo mode, you can disable or re-enable solo mode on all layers that have it enabled by clicking on the Toggle solo mode on or off button in the top row. For when the Onion Skin option is enabled, this allows you to enable or disable Onion Skin on specific layers. TIPTo activate the general Onion Skin preview, in the Tools toolbar, click the Onion Skin button. For more information, see Paperless Animation Tools. NOTEFor more information, see About Selection Locking. Single-clicking a layer's colour swatch toggles Outline mode on or off. Outline mode makes the layer display as nothing but the outlines of its vector shapes in the Camera view, allowing you to see the drawing's shape without it blocking the view of layers behind it. Double-clicking the layer's colour swatch opens a colour picker dialog that allows you to change the layer's track colour. The track colour displays in the layer's track in the Timeline view, allowing you to give special visibility to specific layers. It also determines the colour of the layer's outlines if it's in outline mode. Expands the layer to display a thumbnail of the drawing in the current frame, as well as for each drawing in the timeline. NOTEBy default, the timeline's zoom level does not allow enough horizontal space to fully display the thumbnails of drawings exposed for one or two frames only. To see the thumbnails for drawings with short exposure, you must increase the timeline's zoom level—see Timeline Zoom. An exposure indicator appears at the right of each exposed drawing in the timeline, indicating the amount of frames the drawing spans over. An Opacity parameter appears to the left of the layer, allowing you to set the layer's opacity level. TIPYou can show or hide thumbnails for all drawing layers by clicking on the Show/Hide All Thumbnails button in the top row. Allows you to set the opacity level of the layer. Click and drag the value left or right to decrease or increase the layer's opacity. NOTEThis parameter only displays for drawing layers that are in Show Thumbnails mode. This icon appears next to the active drawing layer, which is the layer you draw on when using drawing tools. 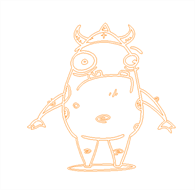 NOTEThe active drawing layer is not always the selected layer. For example, if you select a drawing layer, then a peg layer, the peg layer will be the selected layer, but the active drawing layer will remain the last drawing layer you selected, until you select another drawing layer. The Add Layers button lets you add new layers to the Timeline view. When you click the Add Layers button, a menu appears displaying the available layer types. 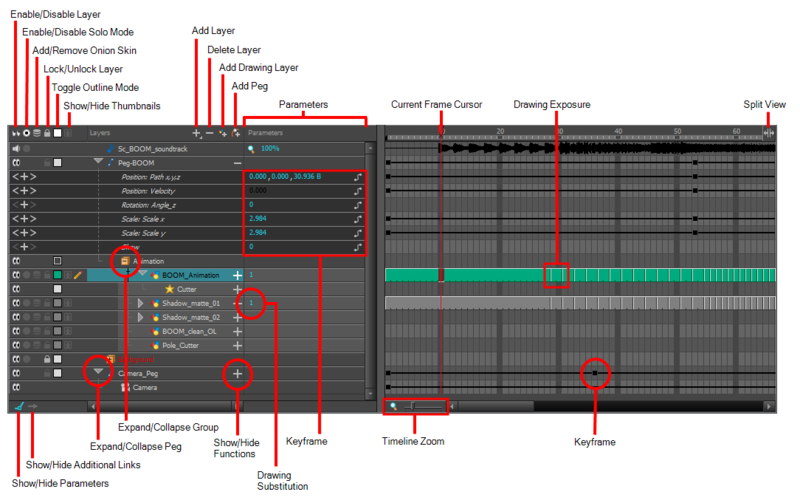 If the layer can be connected to another layer, for example to use a drawing layer as a matte, expanding a layer's functions will also list its possible connections. You can connect layers by dragging and dropping a layer onto another layer's connection. Adds a keyframe at the current frame of the selected function or removes the keyframe at the current frame of the selected function, if there is one already. NOTEThis button only displays for function layers. Moves the timeline cursor to the previous keyframe on the selected function. Moves the timeline cursor to the next keyframe on the selected function. Displays the Function menu, which allows you to create a new function for the function layer, or to link it to an existing shared function—see About Functions. 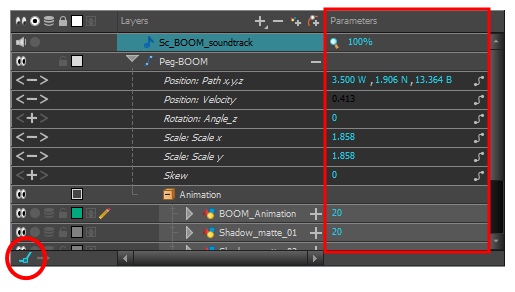 NOTEThis button only displays for functions layers, in the Parameters column—see Show/Hide Parameters. A frame where the value for one or more of the layer's functions is preset. The position of each layers in key poses for digital animation is recorded in function keyframes. You can grab and move function keyframes as well as copy, cut, paste and delete them. In the Timeline toolbar, click on the Delete Keyframe button. NOTEIf a collapsed layer has children that have function keyframes, you will see a white square instead. The Split button lets you split the Timeline view in two sections, allowing you to see two different portions of the Timeline view. This can be useful if you need to often switch between two specific points of a lengthy scene. In the Timeline view, when a drawing is exposed, it is represented by a grey block that extends from the first frame it is exposed to the last frame it is exposed. If the layer is a drawing, it displays the name of the drawing at the current frame. If the layer is a function, it displays the value of the function at the current frame. If the layer is a sound track, it displays the sound track's volume. Using the mouse, you can drag the parameter left and right to change its value. This is especially useful for quickly changing a drawing's exposure at the current frame. Shows or hides the Additional Links column. The Additional Links column displays layers that are connected under the layer, but for other purposes than being the parent of those layers. For example, if a layer is used as the matte of an effect, the effect will be displayed in that layer's Additional Links. If more than one layers are in a layer's Additional Links, only the first of these layers will be displayed, followed by the amount of extra linked layers there are. By clicking on the Additional Links, you can open a menu listing the linked layers, and click on one of these layers to navigate to it. Reduces or increases the width of frames in the Timeline view. Move the slider right to increase the width or left to reduce it. You can also press 2 to zoom in and 1 to zoom out when the Timeline view is focused on. If you want to reset the Timeline view's zoom, click on the Timeline Zoon icon left of the slider.